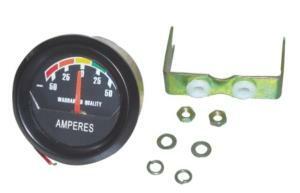 Standard size 2" (52mm) ammeter gauge. Dashboard, panel or gauge bracket fittings included. 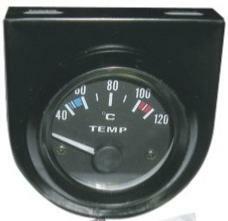 Standard size 2" (52mm) electric temperature gauge. 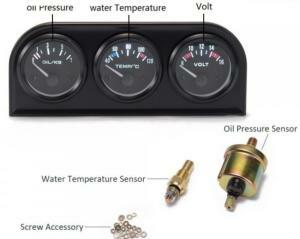 This gauge is supplied complete with a satin black steel mounting bracket designed for under dash fitment, alternatively gauge can be fitted directly into dashboard or panel, fittings for all mountings included. Note that you will require an electrical sender for this gauge to operate. 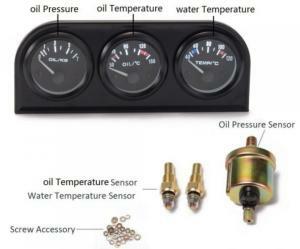 If you are replacing a non-functioning gauge then you should already have a sender. If you are fitting the gauge from scratch (eg building a kit car) then you will need a suitable sender such as we supply. Standard size 2" (52mm) capillary temperature gauge. 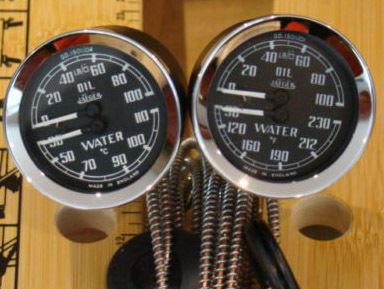 Set 3 gauges in bracket. Standard size 2" (52mm) auxiliary gauges. In satin black mounting panel (189mm by 76mm). Gauges can be removed from panel and used separately if desired. Smiths Dual Gauge Temperature and Oil Pressure 2"
Original fitment to MG Sprite, Midget, MGB, MGA (part number BHA4900) but retro fitted in the 60s and 70s to a host of British classics. Note that this is a new UK Smiths manufactured gauge not a reconditioned unit.